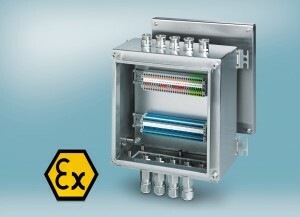 The new Clipsafe stainless steel empty housing and terminal boxes from Phoenix Contact are suitable for use in extreme conditions. 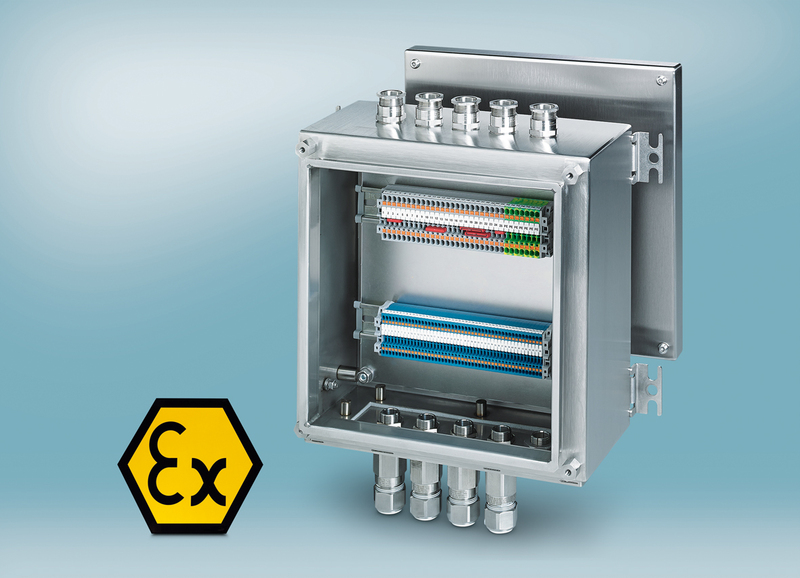 The 140 robust ATEX and IECEx-approved standard housings are available as door or cover versions in nine depths with sizes up to 1000 x 1000 x 300 mm and provide comprehensive protection for applications in industrial environments and in process technology. Designed with practicality in mind, the door stop can be changed to suit the specific installation situation. 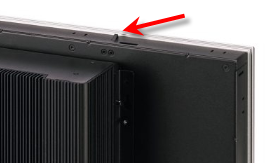 The same applies to the mounting bracket. The special door and cover seal ensures a secure seal, even after opening multiple times. At the same time, the seal support forms a drainage channel which reliably prevents the ingress of moisture and dirt. A door opening angle of 135° ensures comfortable work in case of service and maintenance. Flange plates are possible on four sides of the housing with patented seal protection and captive mounting screws. The Clipsafe empty housing is completely equipped with terminal blocks and cable glands according to customer requirements and customized with threads, bore holes, and rectangular cut-outs. 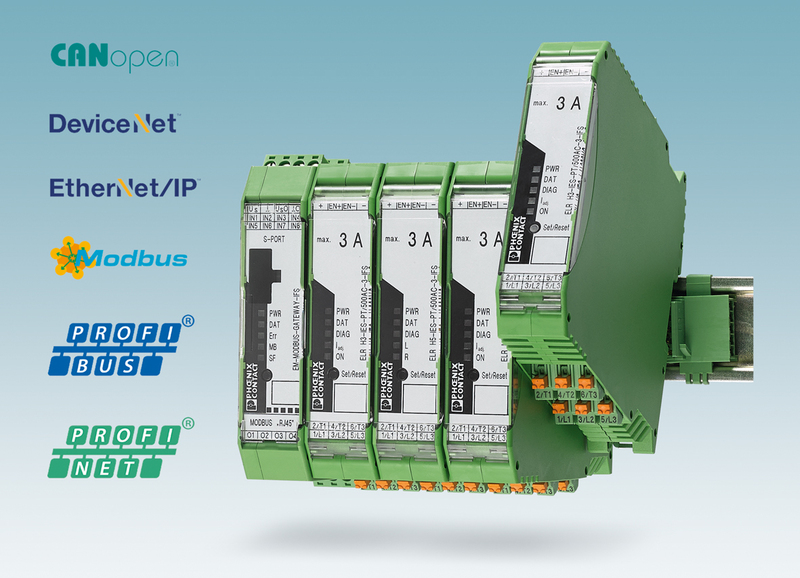 The new versions of the Contactron hybrid motor starter from Phoenix Contact enable quick and easy integration into the common fieldbus systems Profibus, Profinet, CANopen®, DeviceNet, Modbus, and EtherNet/IP™. Process data, such as motor current, is transmitted to the control system via the bus system with the aid of the corresponding gateway. This allows service intervals to be optimized, which plays a role in increasing system availability. Thanks to the efficient wiring concept of the hybrid motor starter, the new devices also enable easy integration of the fieldbus with a short startup time. Mounting is easy with the DIN rail connector as the devices make contact as they snap on. 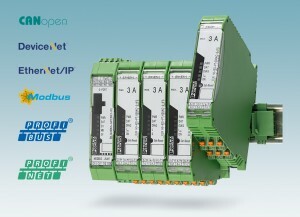 The control signals are forwarded via the fieldbus system, therefore there is no need for digital outputs for motor control on the controller side. 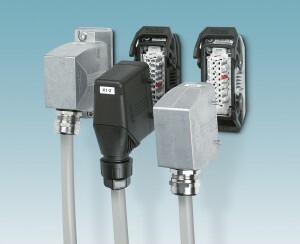 The extensive parallel cabling of the control and signal level is no longer required. All in all, the system offers a compact and economically attractive solution for motor control. Heavycon complete heavy-duty connectors from Phoenix Contact offer a reliable seal up to degree of protection IP69K. There are matching plug-in connections for every requirement with housings from three series types and matching contact inserts which can be combined. The standard series offers a wide range of robust metal housings with various different cable outlet directions and locking mechanisms. The flexible, swiveling bayonet locking of the EVO series allows the cable outlet direction to be freely selected and reduces the number of versions and thereby the warehousing costs by up to 70%. Not only does the direct screw locking without panel mounting base result in cost savings, it also means that the Advance housings are particularly durable and robust. All components can be individually combined and flexibly modified, extended or exchanged. The standard and EVO housing is pin-compatible with the market standard and the Heavycon metal housing is “EMC-ready” thanks to conductive surfaces and seals. Combined with shielded cable glands, they offer you reliable protection in electromagnetic surroundings. All housing series fit standard panel cutouts. Admit it… who has never made any mistake in his/her life. Successful person holds the attitude of embracing mistake, they know that mistakes are part and parcel of life. Therefore, if you want to lead a successful career, firstly you need to accept your embrace your own mistake. Do not finger point, saying it was result of others or certain event that happen, you may end up just searching for an excuse to cover your mistake and you may not achieve the result you want. One good example I had read online was Thomas Edison and his invention of Light Bulb. Everyone knows that it is sometime hard to admit your own mistake, and the easy way out is to point outwards. But when you are brave enough to stand up for the mistake you done, you also build your trust and honesty within your friends and team. I hope this article give you a slight change of perspective towards mistake, to embrace or blame, you make your own decision. Remember, before pointing out the flaws in others… look into yourself. 🙂 Spare a thought for others. The next-generation Valueline Industrial PC from Phoenix Contact is a combination of functional design and high-performance technology. This impressed the Red Dot jury which awarded the Industrial PC (VL2) as the winner for the Red Dot Design Award 2015. Industrial PCs with touch display, commonly known as Panel PCs, are increasingly becoming the main interface between humans and machines. This Human Machine Interface HMI) combines all the operating and monitoring requirements allowing the operator to effectively manage the production processes. At the same time, a high-performance computer could be required for all the control, data storage and reporting tasks in the system. Thus, a combination of modern computer technology and user-friendly design is all the more important. With its clean and sleek design, the IP65-compliant front with multi-touch capabilities acts as the interface for every system. As a manufacturer of innovative automation technology, Phoenix Contact develops robust panel PCs tailored to the requirements of industrial production processes. 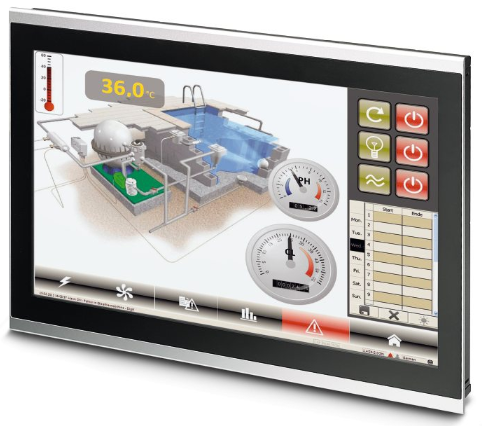 Equipped with modern Intel® Core™ i processors, combined with flexible RAM and storage extension that can be adapted to the requirements; the latest generation of Valueline panel PCs is able to smoothly display ever complex system processes in detail. The rear panel of the housing was optimized for quick maintenance access as shown below; allowing easy access to all essential components. The spring loaded retractable latch shown below temporarily holds the IPC in place, allowing it to be easily installed by 1 person. This increases manpower efficiency as it is no longer required for 2 people to do the installation – one person to hold the IPC in place, while the other screws the mounting brackets. Do contact us via email at info@phoenixcontact.com.sg if you would like to find out more about the innovative and reliable next-generation Valueline IPC from Phoenix Contact!